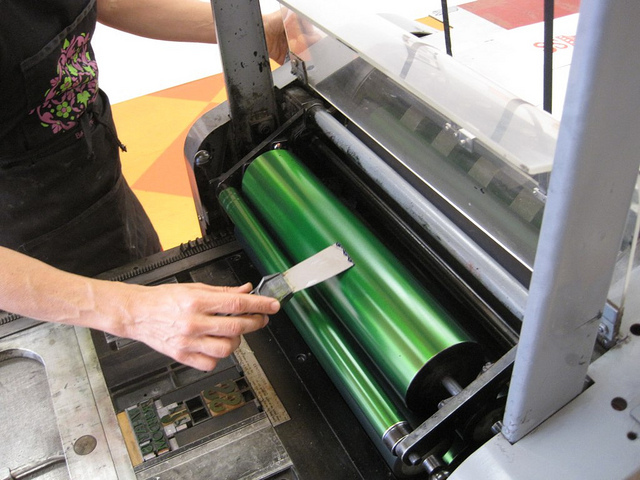 There are a couple of different ways to experiment with printing at PRESS. These options include different types of relief printmaking, the raised areas of a plate or block is inked while the lower areas of the matrix remain ink free. Some of the ways artists at PRESS are working with relief printmaking includes using wood/ lead movable type, polymer plates, linoleum/ wood cuts and pressure printing. Type and linoleum/wood blocks are very hands on ways of printing at PRESS. The type is placed carefully and set snugly in the base of the press to create imaginative and new ways of displaying text. The reverse image of the wood/lead type is pressed into the paper right-reading. Linoleum and wood blocks are carved away at to reveal the reverse of the image the artist wishes to become inked. The block that is printed starts blank and the areas the artists wants to remain white are removed. Polymer plates give the artist an easy and detailed way to make designs into plates without the act of carving; this allows the artist to make plates with intense detail and small fonts. Essentially, anything you can create as an Illustrator or Photoshop file in your computer can then be made into a polymer plate. You just send your file to a polymer output service. Artist Ryder Cooley recently made a polymer plate of a passenger pigeon she designed and printed at PRESS. The relatively new and surprising technique called pressure printing is an interesting way to create a relief print. In this process a template is made by layering paper in order to make the image. The areas with the highest relief will come out the boldest and the areas of lowest relief will come out white or of a lighter shade of the ink used. The low relief collage is then placed under a piece of paper, which is inked as it goes through the press. A halo effect is created around the different layers giving it an almost ghostly style. Pressure printing is definitely a process that takes experimentation since outcome is relatively unknown. While relief printing is the main way to experiment with prints at PRESS the combination of techniques makes for endless possibilities! Previous post ← City of North Adams 15th Annual Winterfest!